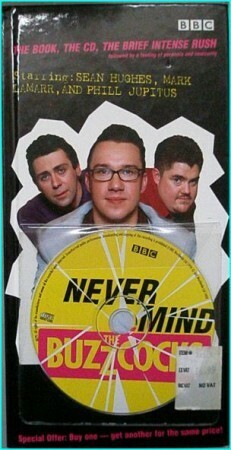 An interactive quiz book accompanied by a CD of music and games, designed to capture the atmosphere of the BBC2 comedy music quiz show “Never Mind the Buzzcocks”. The most popular games are included, such as Identity Parades and I Fought the Law. Never Mind the Buzzcocks is the hilarious TV music quiz hosted by the sharp-talking, sharp-dressing Mark Lamarr with comedy sidekicks Phil Jupitus and Sean Hughes. The books promise to provide you with several days of fun. This is not a book for the serious music trivia addict, more a tongue-in-cheek scrap book of the show. Regular features from the programme are included such as “Connections” (“the round that links pop musics unlikeliest bed-fellows”), “I Fought the Law” (“the bizarre lawsuits brought in the name of Rock ‘n’ Roll”) and “Word Up” (which is all about the meaning of obscure lyrics). The free CD contains footage from the programme and invites you to join in with the “Spot the Intro” round from your own living room. Hilarious book version of the top BBC2 programme. Some familiar rounds from the series appear e.g Connections and the infamous Identity Parade, as well as new features. No pop star is safe – see the “Rise and Fall of the Human League”, and if you ever wanted to dish the dirt on Mark Lamarr – see the cartoon version of his rise to fame. An accompanying CD allows you to pretend you’re taking part. Very funny, and even better on a second reading – you find all the things you missed the first time round!